If you live in Madison, and you’re like me, you probably spend far too much time on Tuesdays and Wednesdays during the summer dreaming up some tasty snacks to bring with you to Concerts on the Square. For those of you who aren’t familiar with Concerts on the Square, let me enlighten you. It’s basically a giant picnic on the capitol square every Wednesday night, during which you get to listen to a free concert put on by the Wisconsin Chamber Orchestra. Even if you don’t live in the Madison area and cannot attend the wonderfulness that is Concerts, you can probably agree that laying out on the grass, drinking wine and eating snacks is not a bad way at all to spend a balmy summer evening. The snacks part is very important though. So in light of tomorrow’s upcoming concert, I’m bringing you some recipes for delicious snacks that are great for Concerts, or even just picnicking in general. The first recipe was inspired by the bountiful kale I received in my last CSA. Kale was one of those things I had a hard time with at first, but after some clever recipe experimentation with last year’s kale supply, I’ve come to realize that it’s actually pretty good! So, this week, I’ve decided to combine it with roasted garlic, chickpeas, and tahini to make some pretty excellent hummus. Of course, with hummus, you have to have something to dip in it, and so I also made some za’atar seasoned pita chips, which I think are the perfect accompaniment. If you’re not sure what za’atar is, don’t worry, I wasn’t sure what it was either until recently, when I discovered it at Penzeys and was intrigued. It turns out that za’atar, besides having a really cool name, is a middle eastern spice blend of sumac, thyme, sesame seeds, and salt. And, as I’ve also discovered while cooking with it, it’s the perfect spice for seasoning pita chips. You can buy it at Penzeys of course, or make some yourself (2 Tbsp sumac, 1 Tbsp thyme, 1 ½ tsp white sesame seeds, ½ tsp salt). Another great thing to make for snacking al fresco (or just snacking in general) are slow roasted tomatoes. Roasting cherry tomatoes at low heat for a long time concentrates all of the sweetness and tomato flavor in these little guys. Making these takes some time, but basically no effort, so you can pop these into the oven, go watch a binge marathon of Cake Boss on Netflix (I mean what else would you do?) and then come back to have some seriously tasty tomatoes come out of the oven. They’re delicious on pretty much anything you can think of, but one of my favorite ways to eat them is on some bread or crackers with a little goat cheese and some Basil and Arugula Pesto. It doesn't get much better than that. Happy snacking! 2. Cut the top off of the garlic bulb so you can see the tops of the garlic cloves and place on a sheet of aluminum foil. Pour 1 tsp olive oil over garlic bulb, wrap in foil, and place in oven. 3. Roast garlic at 350 degrees for about 40 min, or until garlic cloves are soft and light brown in color. Cool, and the remove garlic cloves from the bulb. Note: If you are making pita chips to go along with this, you can roast the garlic at the same time as you are baking the pita bread since they both use the same temperature. 4. Mix chopped kale with 1 tsp olive oil and rub the leaves together for a couple of minutes until the texture becomes softer and more smooth. (This may seem odd, but “massaging” the kale tenderizes it and makes it less bitter without having to cook it). 5. Combine the roasted garlic, kale, chickpeas, tahini, lemon juice, 1 Tbsp olive oil, and salt in a food processor or blender, and blend until fully combined. Check seasoning and season with additional salt if desired. Serve with pita chips (recipe follows). 3. Spread pita triangles on a baking sheet and toss evenly with the olive oil and za’atar. 4. Bake at 350 degrees for 15-20 minutes or until pita chips are golden brown and toasty. 2. 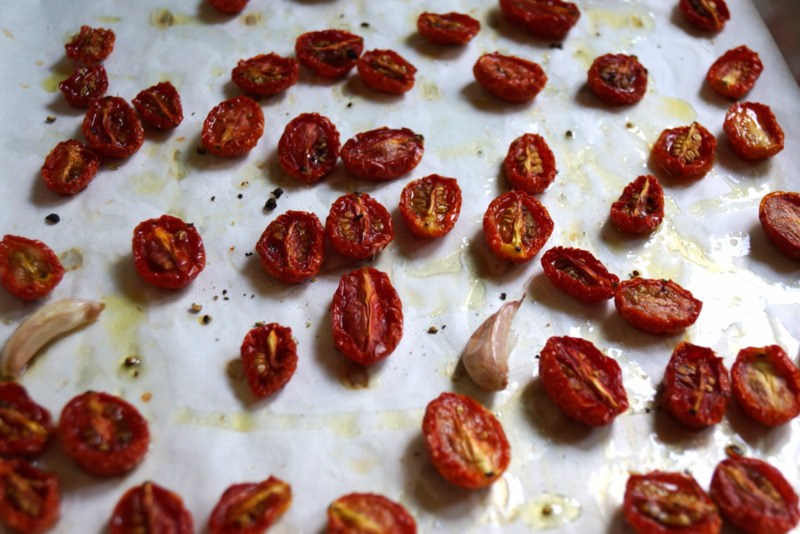 Halve all of the cherry tomatoes and place on a parchment lined baking sheet, cut sides up. Scatter the garlic cloves in among the tomatoes. Drizzle with olive oil and lightly season with salt and pepper. 3. Bake tomatoes at 200 degrees for 3 hours. Allow to cool and store in an airtight container.